For the longest time I'd been itching to try my hand at printmaking art. Setting up an office in my brother's letterpress studio inspired me to finally get some cutting tools and start carving. Below are several personal projects I've completed. I have also incorporated relief printing into illustration and graphic design work which can be seen here. 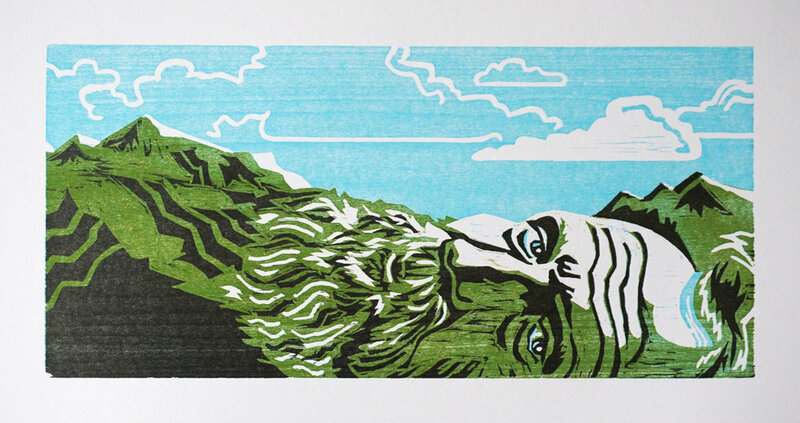 John Muir, 3-color reductive woodcut print. Getting ready to start a new print, I couldn't decide between doing a portrait or landscape. I ended up doing both in one piece. John Muir (April 21, 1838 - Dec. 24, 1914) was a conservationist who dedicated his life's work to studying and preserving the American wilderness. This is a portrait and tribute to the man. 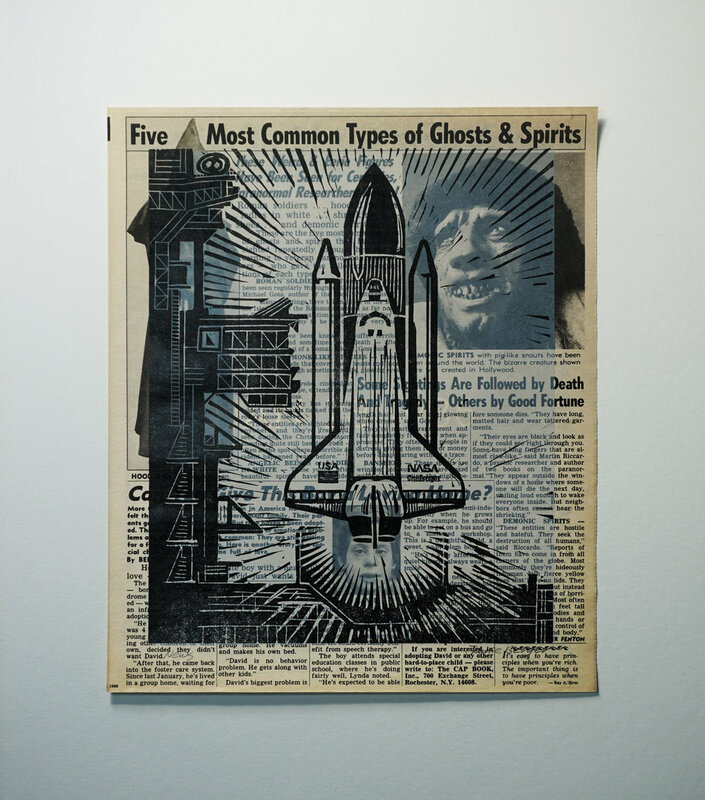 A reductive printmaking technique was used for the piece. This is when a multi-color print is cut and printed from a single piece of wood. More information on the process can be seen on my Etsy site where the prints can also be purchased. Accepted in The Butler Institute of Art, 79th Area Artist's Annual Exhibition. 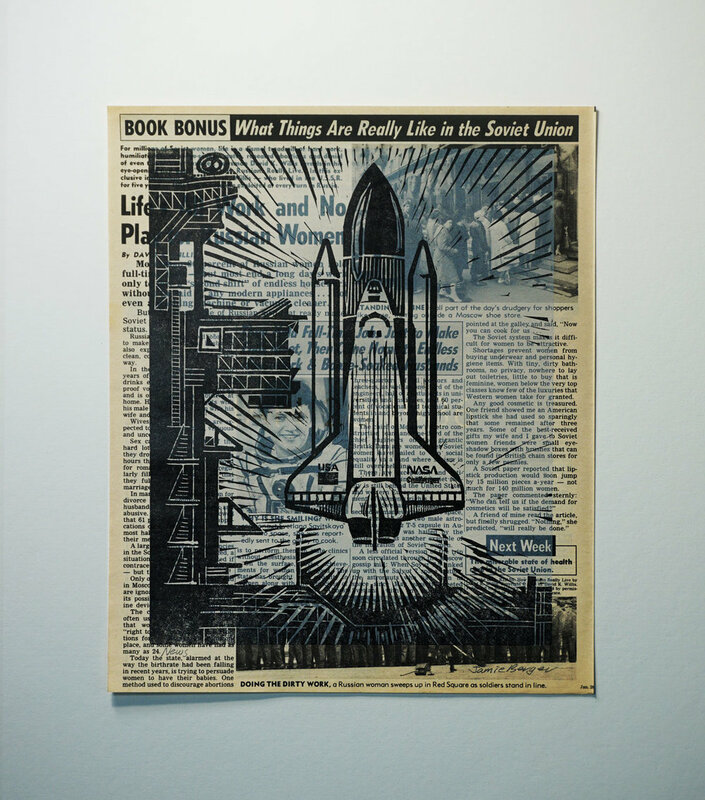 News - January 28, 1986, 2-color linoleum print on vintage newspaper. 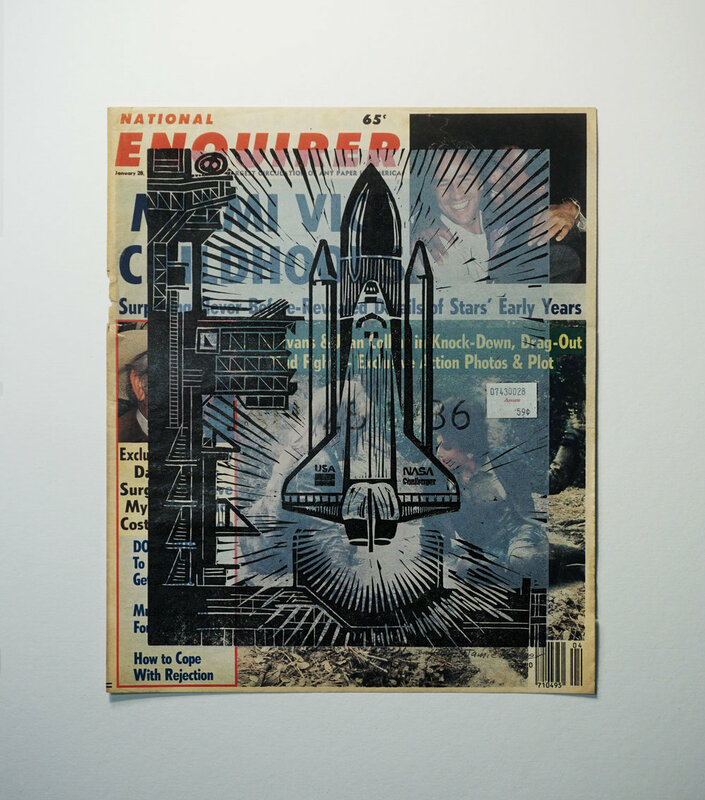 I discovered a stack of old National Enquirer newspapers in our letterpress workshop space and wanted to use the pages from the paper to produce a series of prints. 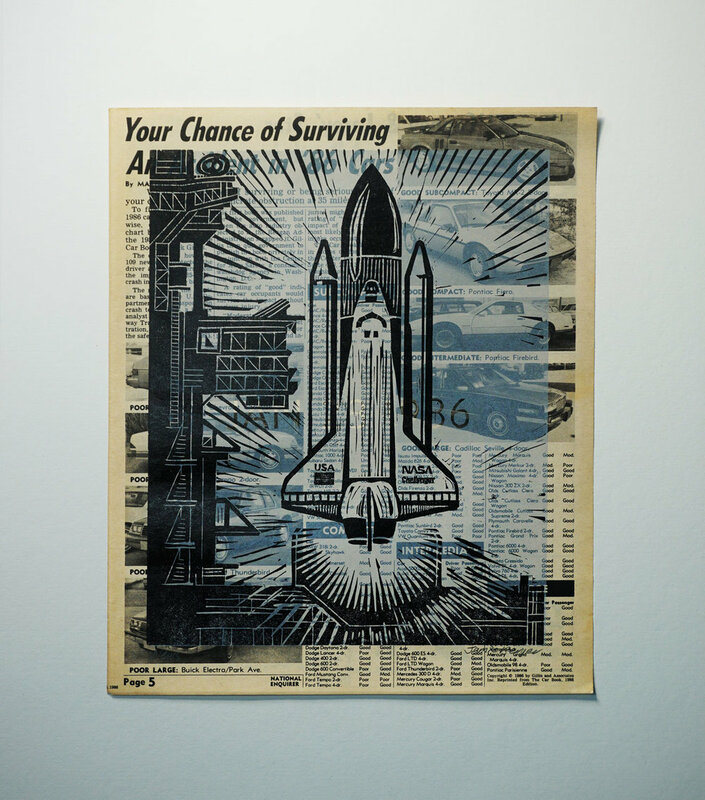 The January 28th, 1986 edition turned out to be the same day as one of the biggest news stories in our lifetime, the Space Shuttle Challenger disaster. This was also a significant day for me personally. 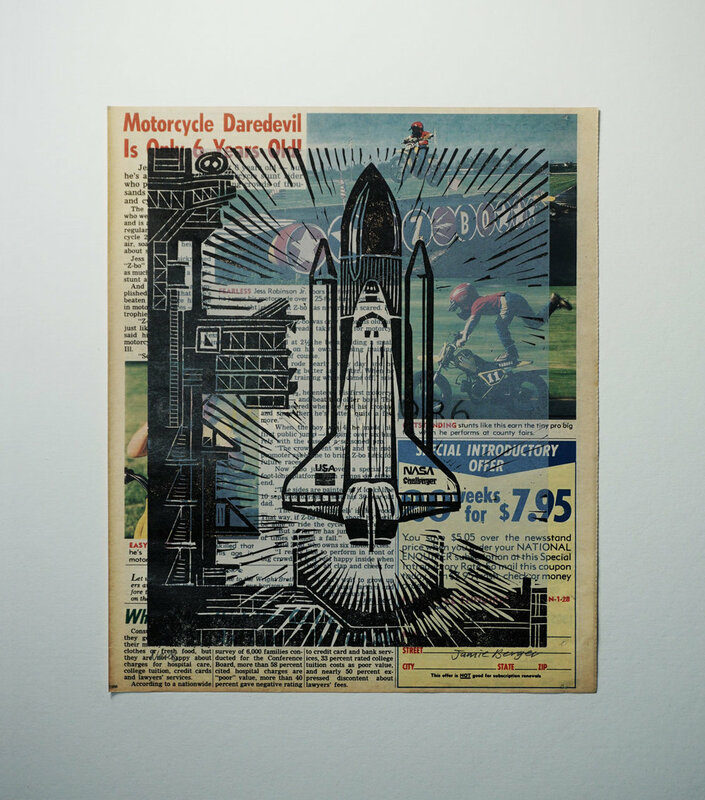 The backstory behind the 2-color linoleum cut and the entire print series can be seen in this post. Some of the different print versions can be bought here. I don't know if it's a distraction or an obsession, but often while listening to music on Spotify I find myself researching the artist's online biography. It's interesting to try to understand the people behind the tunes. I've always known Ohio has a rich musical history. All the digging around gave me the idea to compile a playlist of music by Ohioans titled Ohiophonic. This was followed by two YouTube playlists that are reenactments of Alan Freed's Moondog Coronation Ball concerts that was shut down by Cleveland Police in 1952 and never took place. Songs by the musical artists that were scheduled to play can be heard in Part One and Part Two here. Of course I've barely scratched the historical surface, but two Ohiophonic themed letterpress prints have been completed. 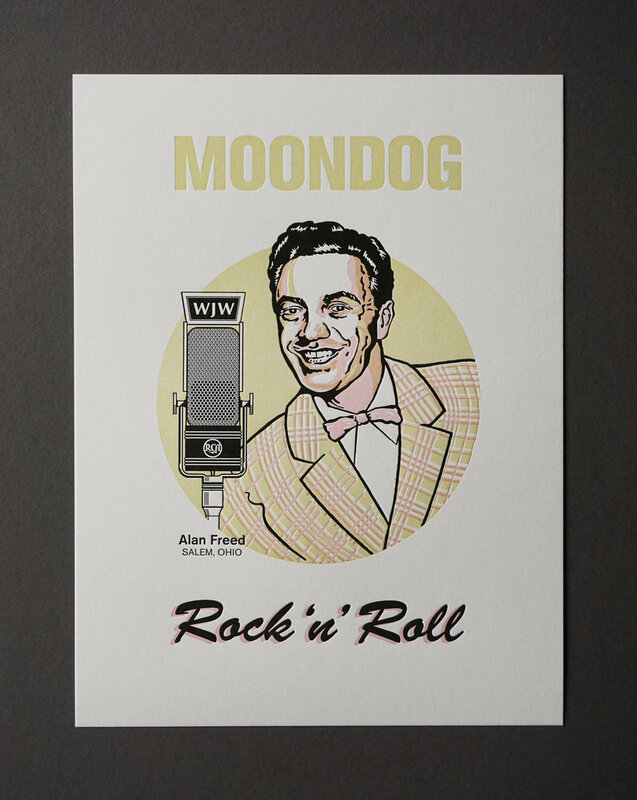 The first honors 'Moondog' Alan Freed and the 2nd Cleveland's Screamin' Jay Hawkins. I hope to return to the preoccupation with more prints in the future. 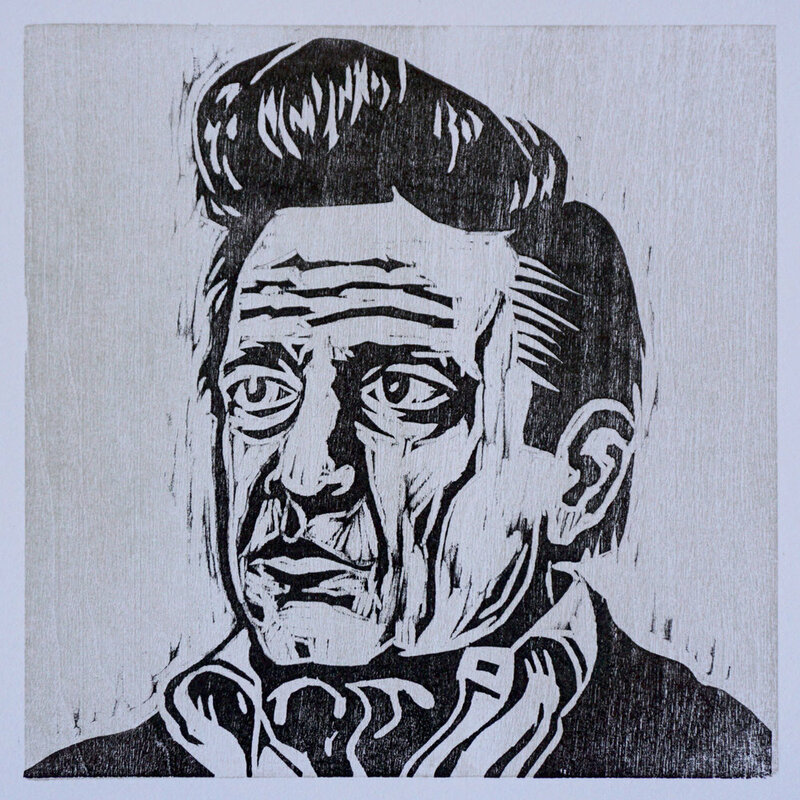 Johnny Cash, 2-color woodcut print. After working on the two Ohiophonic prints above I decided to explore woodcut printmaking. I also thought I'd do a tribute portrait print of a bigger name musician. Johnny Cash is a country music legend and very much a crossover star whose music appealed to a broad audience. 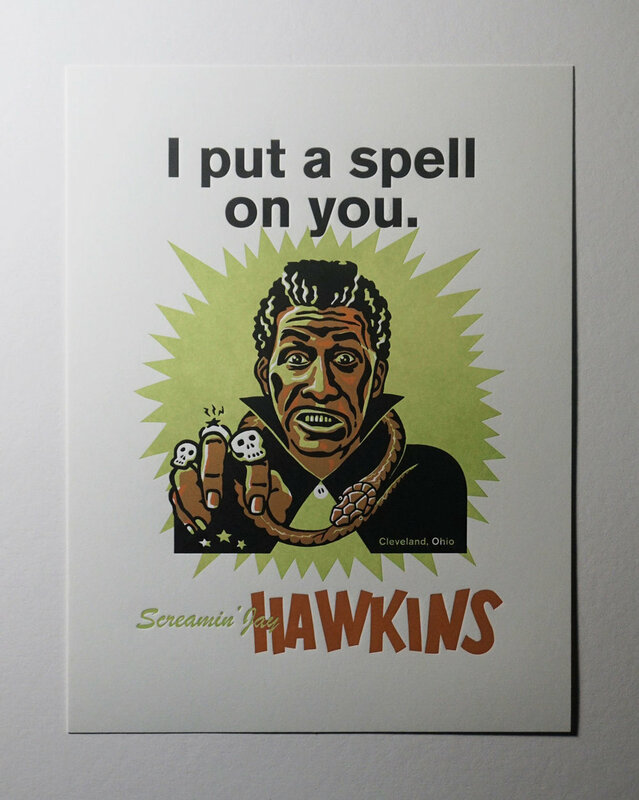 He seemed like an ideal subject for a woodcut print. I experimented with different colors, background techniques and even digitally manipulated versions of the print. Process notes and the different variations can be seen here. Design and artwork for the Ohiophonic prints were created digitally. 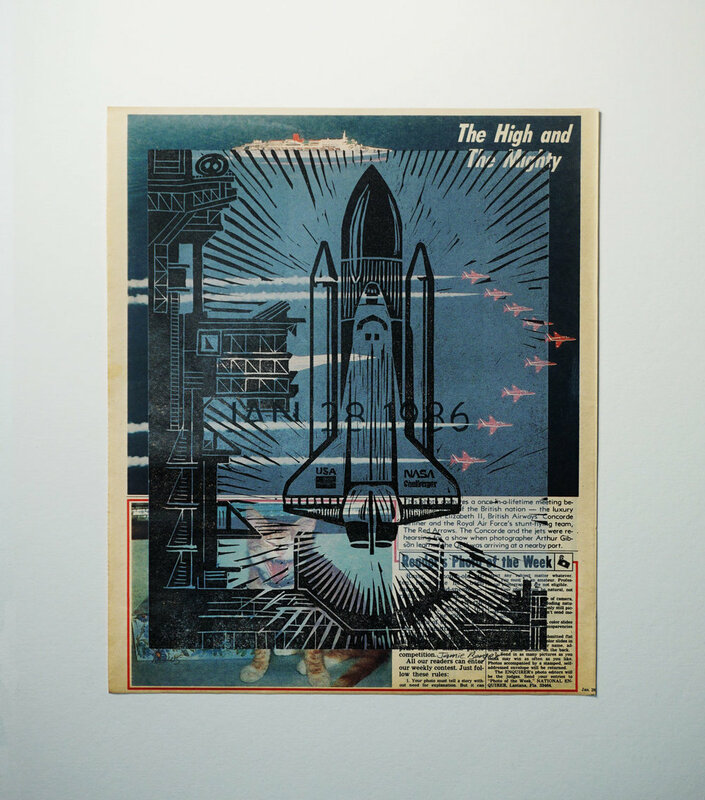 The Ohiophonic letterpress printing was done by Jason Vaughn on a Heidelberg Windmill press. Music for the Coronation Ball YouTube videos was selected and compiled by my son - Chicago's DJ Bergadelic.